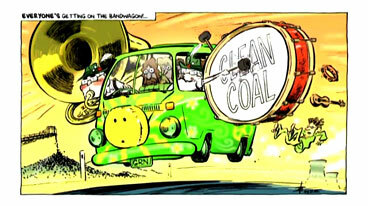 Video clip synopsis – David Pope takes us through the evolution of his political cartoon "The Environmental Bandwagon"
Broadband MP4 dpope3_bb.mp4 (5.6MB), suitable for iPods and computer downloads. How often do you ask a cartoonist to produce a cartoon related to a specific article in your paper? What would cause you to do that? Have you ever rejected a cartoon produced for a specific article? If yes, why was it rejected? What are the sorts of articles for which you will not commission a cartoon? Cartoonist David Pope refers to the use of ‘visual metaphor’ in his work. How does a ‘visual metaphor’ function in a cartoon? Select a topic from current affairs. Make a list of how many ways the topic could be interpreted in a cartoon format. Choose one of the interpretations and develop a cartoon from it.